The five-game AUDL opening weekend was a thriller: four of the five games were decided by two points or fewer, there was a history-making comeback, and the stage is set for the debut weekends for the East and Midwest Divisions, including the New York Empire and Madison Radicals, the league’s #1 and #2 ranked teams, respectively. The San Jose Spiders made AUDL history, coming back from a seven point deficit to defeat the Seattle Cascades 28-27 in overtime. The first point was a microcosm of the game itself. Mark Burton looked deep immediately to Brad Houser off of the pull, but the throw was just out of reach. San Jose picked up and used a few break throws to open up a window to huck; Justin Norden was able to beat Houser deep to catch the half field huck. Seattle, of course, answered right away, setting up a back and forth affair. Seattle’s D-line took control early, fast breaking every chance they got to build a quick 9-4 lead. Khalif El-Salaam owned the skies, notably beating Marcelo Sanchez badly on an underthrown huck. The Cascades hit buzzer beaters to end the first and second quarters to take a 16-10 lead into the half. Of course, the D-line needs to get the disc in the first place. San Jose did not make many glaring mistakes, but the Cascades played smart help defense with plenty of switches downfield to stop initial pull plays and take away easy looks. The Cascades offense featured plenty of classic Seattle small-ball. Henry Phan contributed all over the field, Kodi Smart was a rock in the backfield, and Steph Lim can break any mark. The three of them kept possession until a deep shot materialized. Newcomer Jay Boychuk fit in seamlessly to the Seattle O-line cutting off of Brad Houser. He led the squad with seven goals in his team debut, and also added four assists, leading the team with a +9. Mark Burton led the Cascades with seven assists on 50/51 throwing. San Jose did not accept their deficit quietly. Just before halftime, Justin Norden, who started the game on defense, slid over to the offense, a move the Spiders made last season when they needed more stability. The Spiders offense moved with more urgency in the second half and their D-line was able to play patiently without Norden and began to punch in some breaks. Antoine Davis, who led the team in points played with 31, crossed over for quite a few D points, and the Spiders mounted an impressive comeback, cutting the Seattle lead to 21-19 entering the 4th quarter. Lior Givol impressed in his first game back with the Spiders, leading the team with six assists and five goals. He was often called upon to initiate the cutting set downfield and throw deep continues to Davis or Marcelo Sanchez. Jacob Greenberg came through in clutch time, collecting a layout block to save a Seattle goal before breaking loose on a deep cut for the game tying goal with 1:39 remaining in the 4th quarter. Neither team could score on the ensuing possession, and the game moved to overtime. In the extra period, both teams looked exhausted. San Jose pressured the Seattle offense from the start and broke on the first point. They maintained that lead thanks to another clutch Greenberg block with 32 seconds left to open their season 1-0. San Jose just missed the playoffs last season and has to feel excited to start this season with a statement win on the road. Their coaching staff should be happy with the halftime adjustments they made, and the team’s ability to focus during critical points. The win will feel nice for San Jose, but Seattle can walk away with some positives too. They came out with a lot of energy to build their first half lead, and held in to keep the game close when the Spiders came back. In the season opener for both teams, the San Diego Growlers beat the Los Angeles Aviators 20-18. LA grabbed an early 3-2 lead, but the Growlers immediately answered back with a hold and a break. San Diego kept that lead through 10-9 at the half. The Aviators never held another lead but did tie the game at 17-17 late in the 4th quarter. San Diego held on their next point, extending their lead to 18-17. Then, the Growlers were able to punch in a break after subbing in their starting offensive players during a mid-point timeout. It looked like the Growlers’ Travis Dunn overthrew a huck, but Sean Ham tracked down the long disc for the break that would provide the final margin. Helton often initiated the offense from downfield, but was comfortable moving into the handler set a well. Ham took advantage of the increased space downfield, leading the team with 7 goals, many of them impressive catches over defenders. The Aviators tried a few different defenders, but no matter who they threw out there to defend him, Ham was able to get open. Trevor Purdy impressed for the Growlers as a smart defender who caught heads-up blocks and owned the skies, notable catching a buzzer-beating huck from Helton to end the first quarter. He is an early favorite for breakout player of the year. On the other side, Los Angeles played a really sloppy game. Of course there will be some rust in the first game of the season, but some of the Aviators’ turfed throws and drops were unforced mistakes. If the Aviators had played a cleaner game, they might have been able to make up their two-goal deficit. It could take time for LA’s new O-line to coalesce, but they don’t have too much time to spare in a 12 game season. Tim Beatty, Tyler Bacon, Sean McDougall, and Eric Lissner looked comfortable running the offense, but from there the talent thins out quickly. Zach Theodore spent most of his time on defense last season and has the potential to be one of the division’s great deep threats, but he did not always appear in sync with his line-mates and made some execution mistakes. Michael Kiyoi made some nice plays as a hybrid mid, but is still figuring out exactly where he fits in on offense. For the Aviators to be successful, they will need everyone working together on the same page. LA also has some college-age reinforcements coming later in the season, but will need its active talent to build chemistry and lift the team to a few wins first. This is real! 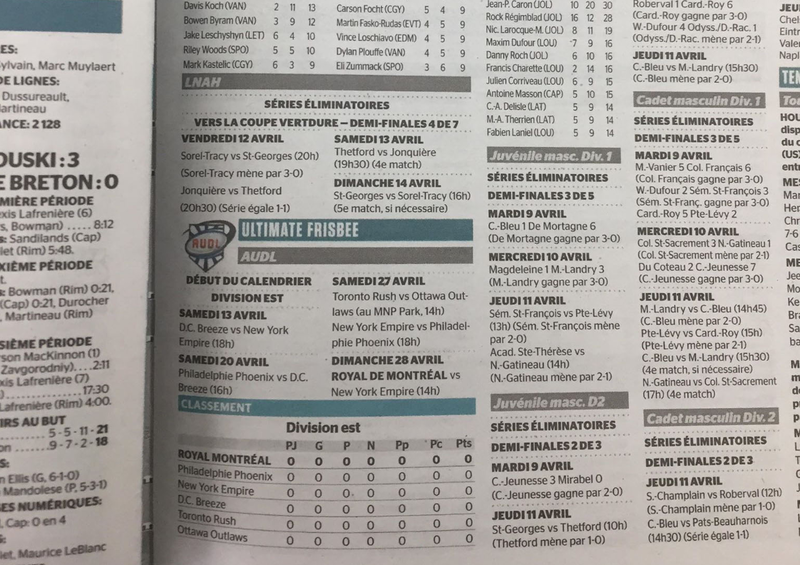 The Journal de Montreal, the largest circulation newspaper (over 230,000) in Quebec and the largest French language newspaper in North America, prints AUDL box scores. The rollout of the AUDL’s new subscription service, AUDL.tv, did not go well. The streaming server that hosted the games struggled to handle the influx of viewers and there were stream cutouts and technical problems throughout the weekend. Multiple teams ultimately switched their streams to YouTube or Facebook due to the issues. This week, the league completely switched technology platforms and is now hosting their games on Vimeo OTT, which features a robust livestreaming backend. The season’s first Game of the Week on Stadium — the Raleigh Flyers v. the Austin Sol — went much more smoothly. This week, the Game of the Week features the New York Empire v. the DC Breeze on Saturday night, with commentary from Evan Lepler and Ultiworld’s Charlie Eisenhood. The Raleigh Flyers looked to be in a great position to take down the Dallas Roughnecks on the start of a difficult season-opening doubleheader in Texas, but some critical errors down the stretch in the second half allowed Dallas to claw back into the lead and get the 19-17 victory. Despite the loss, it was a stellar debut for Henry Fisher, who led the team in plus/minus (+8) and looked right at home in the big open spaces of the AUDL field, scoring a game-high seven goals. He wasn’t quite as spectacular in Raleigh’s 22-18 win over Austin on Saturday but still had four goals. Fisher, who will represent the US on the Under-24 Men’s National Team this summer in Germany, looks poised to have a huge AUDL season. All credit to the Dallas Roughnecks, though, who steadied a shaky offense early on and amplified the defensive pressure in the second half with strong performances from young stars Jay Froude, Carson Wilder, and Abe Coffin. They do not shy away from the moment. Austin still looks like they are a step behind Dallas and Raleigh in the South. The Seattle Cascades have had a Women’s roster for multiple seasons now, but we are seeing the signs of more structure out West in what could be a precursor to a West Division for the Premier Ultimate League. 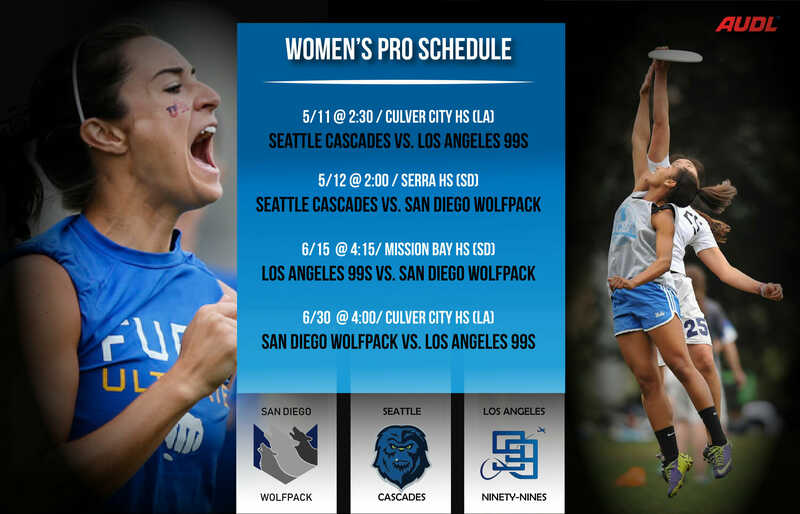 The Southern California Women’s Professional Ultimate Series features home and away games between the Los Angeles 99s and the San Diego Wolfpack. The Cascades women’s team will play a pair of away games on a back-to-back road trip. Comments on "AUDL Throwaround: San Jose Comeback, Henry Fisher Debut, Newspaper Box Scores"